It’s true, each end of summer, I would secretly get giddy about the upcoming school-year. The set-schedule, the routine, getting back into a familiar groove. And the outfits. Even as an adult, I still love ‘back-to-school shopping’ with my kids and giving my own closet a little refresh for the new season ahead. This outfit not only channels some serious back-to-school vibes, but it’s also a perfect way to recycle all those beloved skirts from summer. This tiered, white one with crochet detail is from Abercrombie & Fitch and has been a closet staple of mine for almost a decade! 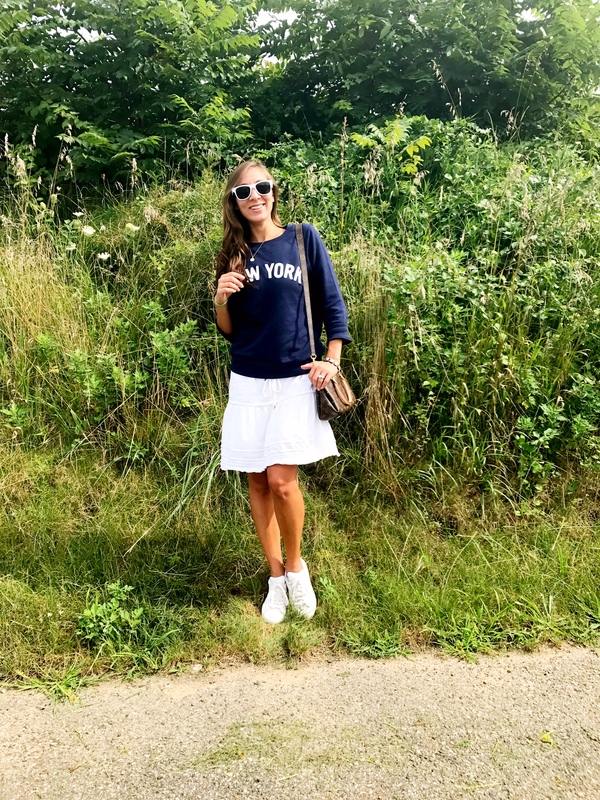 A crisp white skirt is so easy to wear for all seasons by the simple swap of a tank for a crewneck sweatshirt, like this one, or by slipping out of your favorite sandals and into new tennis shoes. There is something so timeless about the combination of black and white. It always looks crisp and polished. And it is a go-to in colder months, but lately I found myself reaching for black and white in my closet during the summer, too. 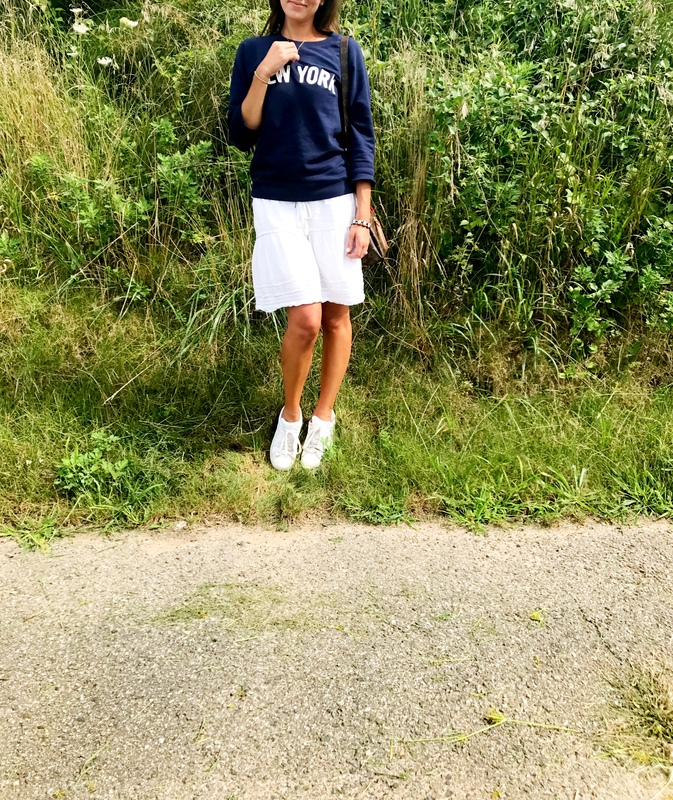 These shorts have become a favorite of mine this season. I have worn them into the ground and they still keep giving. And although I have paired them with so many different tops, flowy blouses, floral off-the-shoulders, I love adding a plain white tied tee or this (exact one sold out, but same version in pink here and another similar style here and here) perfect crop top for an easy classic look. How do you style classic black and white for summer? Drop me a note and let me know! Yellow has always been a color that I have associated with happiness. It is bright and warm and instantly puts me in a good mood. And it looks especially good with a summer tan. 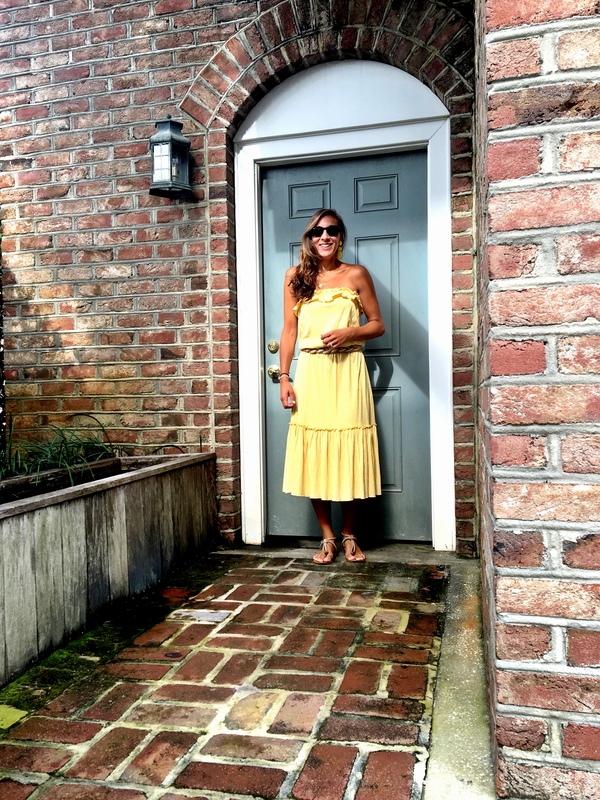 I have this one yellow dress that I purchased at a little beachside boutique about 10 years ago, and I still reach for it each time I need a little pick-me-up. I packed it in my suitcase for our family vacation in South Carolina and wore it out in Charleston yesterday with these perfectly coordinated tassel earrings in lemon. 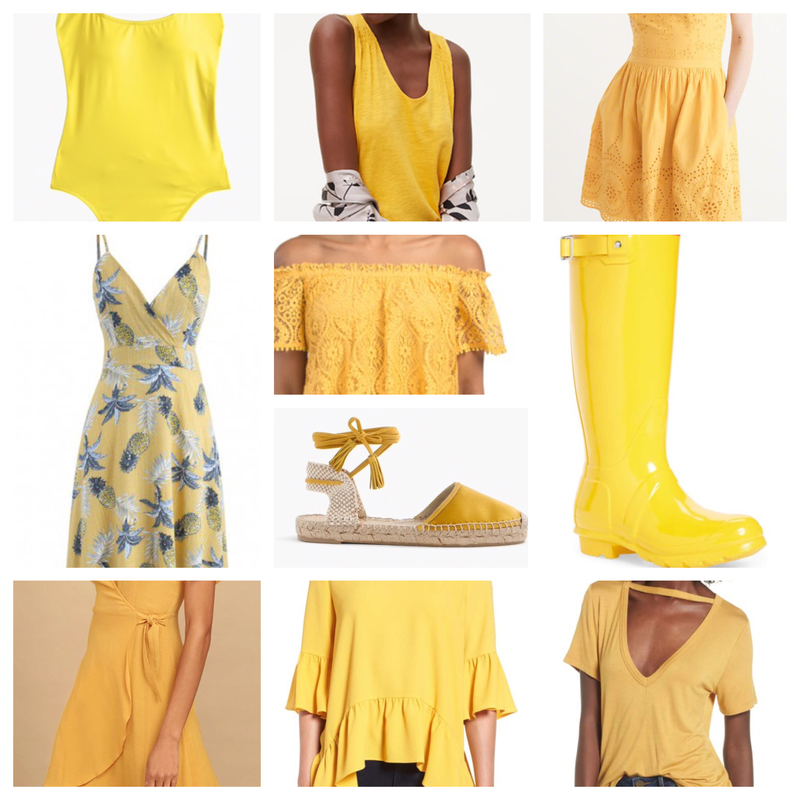 Here are some sunny picks you can scoop up right now. 1. I had been looking for a flattering, no-frills, one-piece and this one is perfection. 2. The best soft tank for pairing with blue or white denim all season long. 4. Casual enough for errands in a great retro print. 5. Love the lace and the off-the-shoulder style of this under $25 top! 6. These espadrilles remind me of a seaside European vacation, and I don’t mind the thought of that. 7. Just about the only thing that can make a rainy day a little brighter. 8. 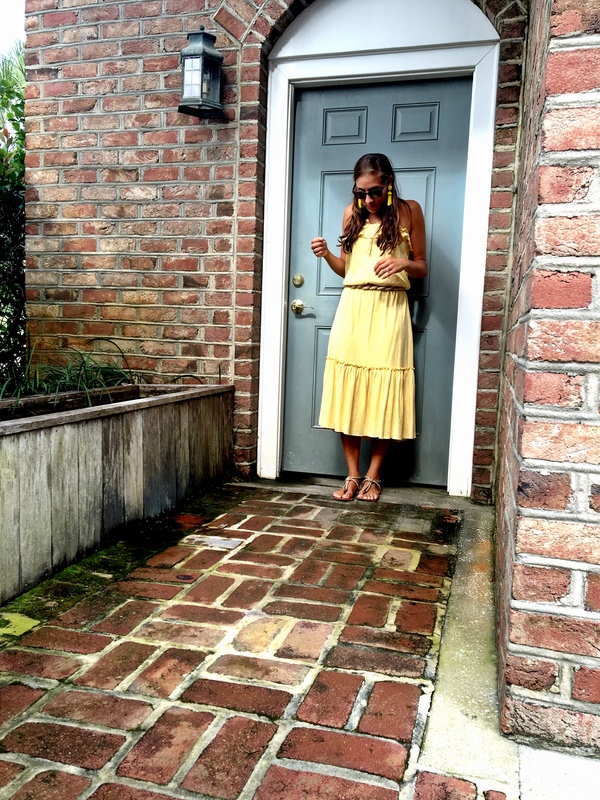 A simple wrap dress in golden yellow. 9. A not-so-basic tee for everyday. 10. And one more anything-but-basic tee with a trendy chocker-style strap.